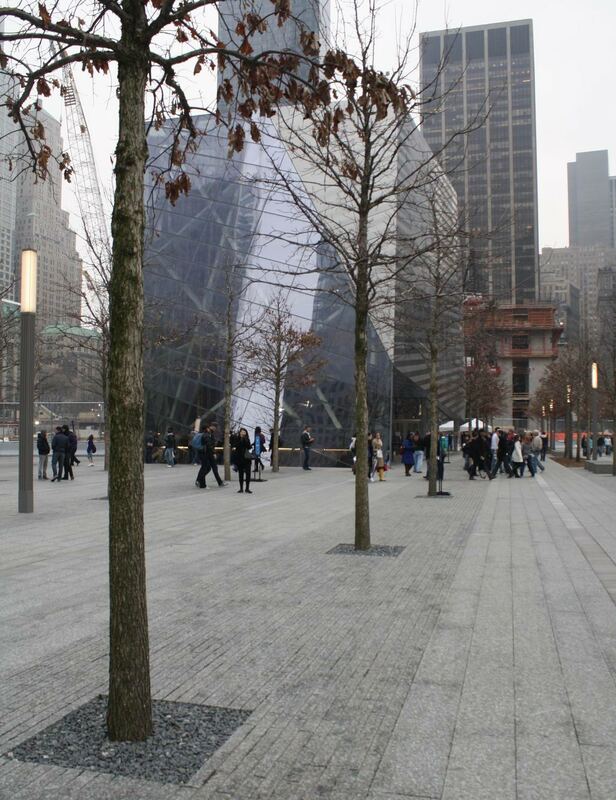 I visited the 9/11 Memorial in New York City on a gloomy, gray day in mid-March, but the monochromatic colors of the pavement, buildings, leafless trees, and sky seemed fitting for this solemn and contemplative space. In warmer months, with the greening of the trees and lawn areas, the site is certain to have a somewhat different feel to it – one of renewal amid the remembrances of tragedy. 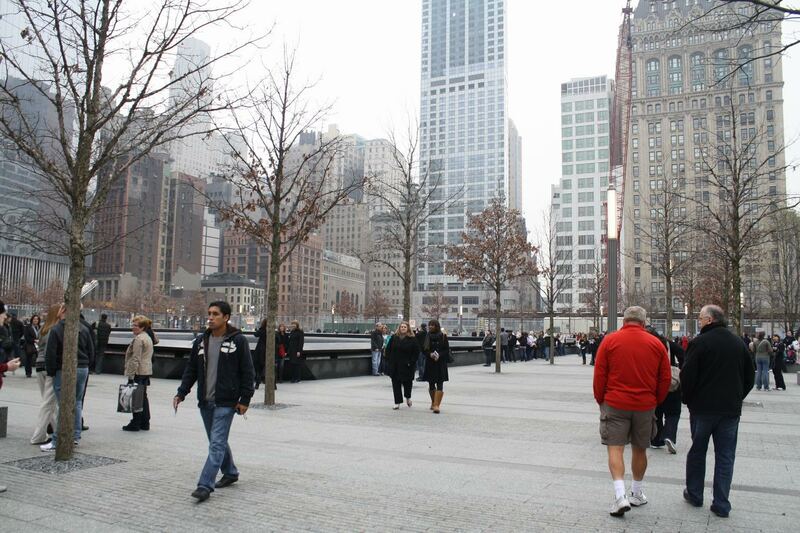 The 8-acre Memorial Plaza is punctuated by two reflecting pools, each an acre in size, in the locations of the former twin towers. 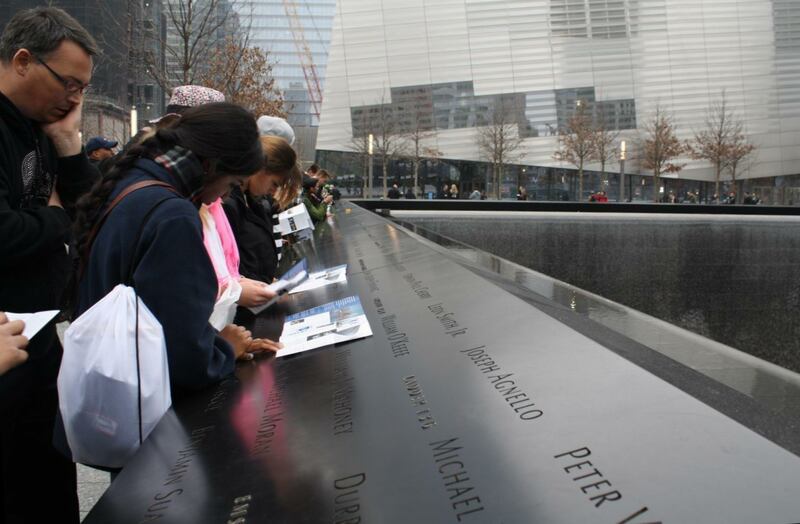 Each pool is framed with dark bronze parapets which are inscribed with the names of the victims. 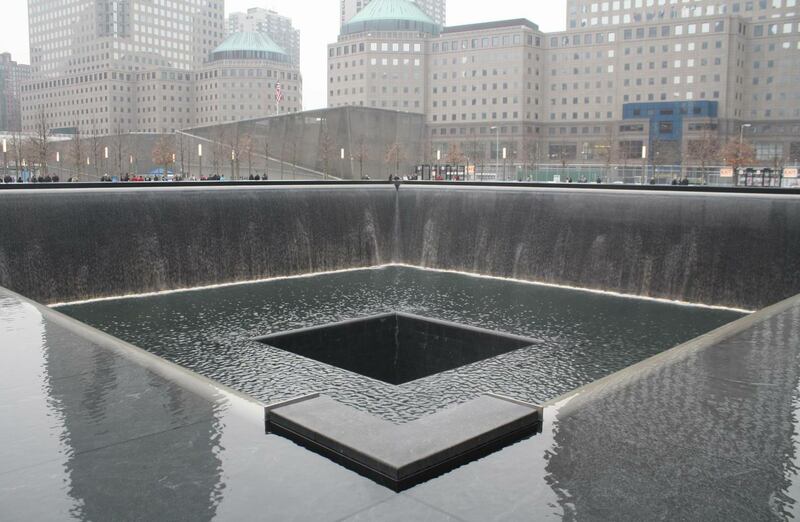 On all four sides of each pool, water continuously falls 30 feet down into recessed areas, and then flows into smaller 30’ x 30’ voids in the center of each pool – in total, a representation of loss and absence. 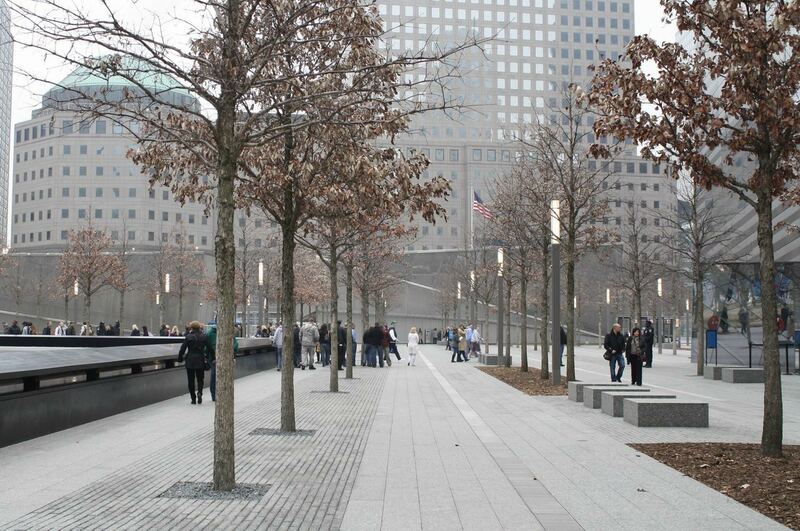 Once the numerous trees in the plaza grow large enough so their canopies merge, visitors’ views will be directed horizontally, toward the memorial pools and elsewhere on the site. The plaza will then feel more enclosed, with the trees obscuring the distraction of the surrounding tall buildings as people approach the pools. 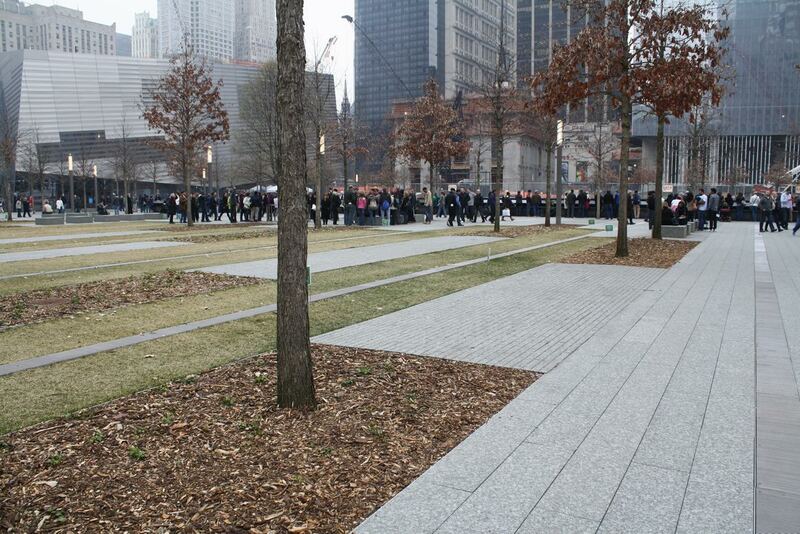 The Memorial is beautifully poignant, and the abstract minimalist design of the pools works very well in this case. I hope to return during a warmer time of year, to experience the site when the green hues complement the grays. Names of victims are inscribed in bronze parapets surrounding the pools. 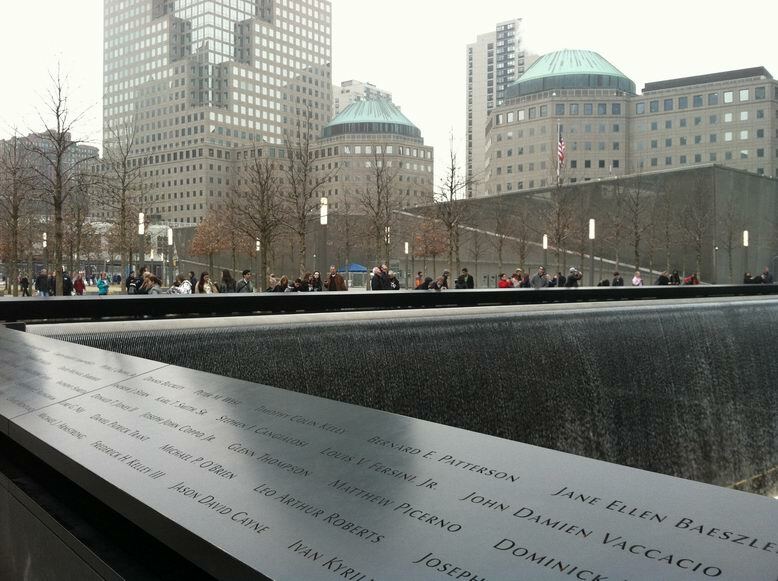 This section of the South Pool includes the names of the first responders. Water flows into a void in the center of each pool. At night, the waterfalls on the sides of the pools are lit from behind. 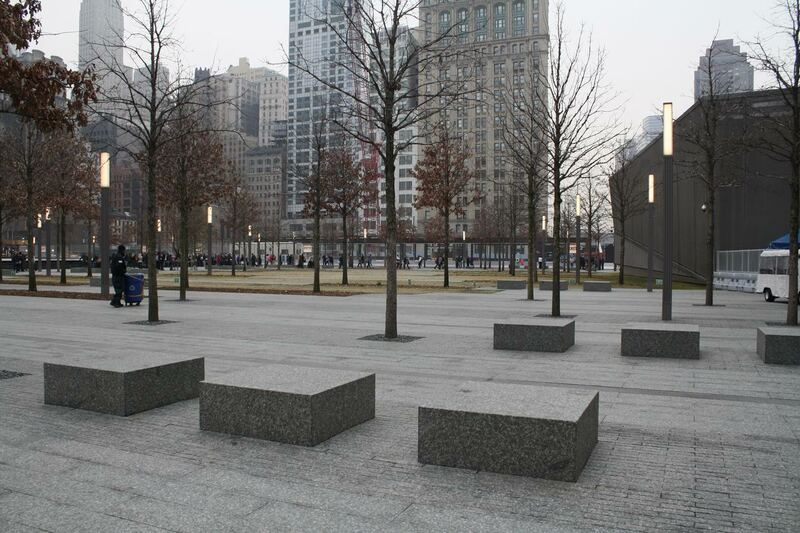 The trees, paving, lighting, and seating throughout the site are arranged in a visually-pleasing linear fashion.